Infants aged four and two killed in family poisoning; pest exterminator arrested. The four year-old daughter of a Jerusalem family poisoned in their Givat Mordechai home has died Wednesday, as disturbing new information about the material responsible surfaces. Dr. Ovadiah Shemesh, Deputy Director of Jerusalem's Sha'arei Tzedek hospital, revealed that the poison responsible for killing a 2-year old and a 4 year-old and hospitalizing the rest of their family is the same material used in chemical weapons in Syria. Investigators have named the material as Phosphine, a powerful poison that is flammable, odorless, and difficult to detect. "The substance can be used as a pesticide - as long as strict safety procedures are followed," Dr. Shemesh stated to Channel 2. "However, what we're dealing with is someone - probably a professional - who distributed the poison in an enclosed room two days ago." He revealed that the family had experienced side effects of the poison as early as Tuesday night, including diarrhea and vomiting. Dr. Shemesh also revealed more disturbing news: there is no medication to help alleviate the poison's effects. "There is no medication available to treat poisonings like this," he elaborated. "We treat patients exposed to the substance with oxygen treatments and fluid regimens to help the body stabilize." "We are talking about the same poison that was used in the Syrian chemical weapons attacks," he continued. "I have encountered cases of exposure before, but never something as tragic as this." 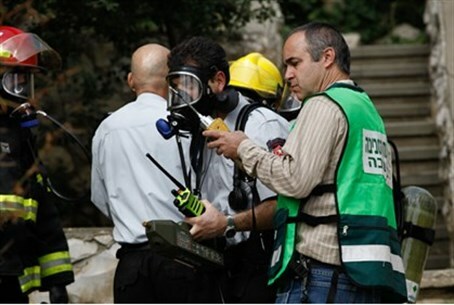 Magen David Adom (MDA) medics rushed to the family's Givat Mordechai home Wednesday after the family's youngest children fell unconscious. The family's 2 year-old daughter was found dead at the scene; two other children, 6 and 8, are in serious condition; and both parents are in light to moderate condition. Investigators have yet to determine whether or not this is a deliberate attack or an act of terrorism. Police arrested the exterminator responsible for the pesticide Wednesday afternoon.